"Purchased Lives: The American Slave Trade from 1808-1865"
Through 8/25: Fri-Wed 10 AM-5 PM, Thu 10 AM-8 PM, Illinois Holocaust Museum and Education Center, 9603 Woods Dr., Skokie, 847-967-4800, ilholocaustmuseum.org, $15, $10 seniors, $8 students, $6 children five-11, free children under five. The Act to Prohibit the Importation of Slaves went into effect on January 1, 1808, effectively ending the transatlantic slave trade from Africa. It did not, however, end the demand for slaves in the United States. The Louisiana Purchase had recently doubled the size of the country, and the expulsion of Native Americans opened up even more land for white settlers. The cotton and sugar plantations in the new states of Louisiana, Mississippi, Alabama, and Arkansas would make the American south the fourth-largest economy in the world. None of this expansion would have been possible, of course, without slave labor. Between 1808 and 1865, one million people were transported from the "upper south"—Maryland and Virginia and the Carolinas—to the deep south, by boats and trains and on foot, chained together in coffles, marching through cities. This history is now on display in "Purchased Lives: The American Slave Trade from 1808 to 1865," a new exhibition at the Illinois Holocaust Museum and Education Center on loan from the Historic New Orleans Collection. Its connection to IHMEC is obvious, says chief curator Arielle Weininger: "When one group decides another group is 'other,' when that group is brutalized and families are torn apart and people are murdered, the parallels connect our histories." "How do you humanize this story and connect it to the reality of 2019?" asks Erin Greenwald, who curated the original exhibit. In the 50 years before Greenwald began work on "Purchased Lives," the Historic New Orleans Collection had never done an exhibition on slavery, even though New Orleans was the nexus of the domestic slave trade for the first half of the 19th century. (At one point, there were 50 markets in the city, not counting informal sales on the ships and levees.) Nor had the Smithsonian, said Nancy Bercaw, the chair of the division of political history at the National Museum of American History, who joined Greenwald and Christopher Reed, a professor emeritus at Roosevelt University, for a panel discussion on Sunday moderated by the Triibe's Morgan Elise Johnson (who occasionally contributes to the Reader). The reason, said Bercaw, was that historians—a largely white and male population—had claimed there were no objects to display. "Oddly," she said, "there were objects everywhere." New Orleans was particularly rich in documentation: customs manifests, warrants to seize property subject to forfeiture, newspaper ads, and bills of sale, which, unique to Louisiana, were kept as public records. Greenwald also had access to testimonies of former slaves collected by the Works Progress Administration in the 1930s. All of these things are on display in "Purchased Lives." It is unsettling to see a three-foot-long shipping manifest that, in exquisite 19th-century copperplate script, lists human beings by name along with their ages, weights, trades, and degrees of blackness ("black," "yellow"), as if they were cattle or furniture. These manifests and bills of sale contain a disproportionate number of ten-year-olds; ten was the youngest age a child, under Louisiana law, could be separated from his or her mother. "The only birth records were on plantations," says Greenwald. There was profit to be made from inaccuracies. "Owners would lie to place a small child into the trade." 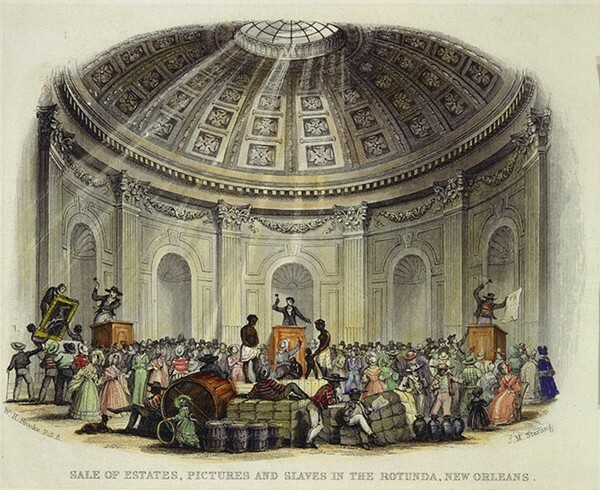 Many auxiliary industries grew up in New Orleans to support the slave trade. There were suppliers of cheap clothing, markets that fattened up new arrivals before they were sold, and hospitals that provided medical care because, since Louisiana was the first state with lemon laws (meaning merchandise deemed defective could be returned), it was in the dealers' best interests to sell healthy slaves. The Touro Infirmary charged $1 a day for slaves; a record book, on display, shows who was paying. There were, of course, attempts at resistance. Slaves would slow their work, break their tools, or go into hiding. Newspapers frequently carried ads from owners looking to recover runaway slaves. 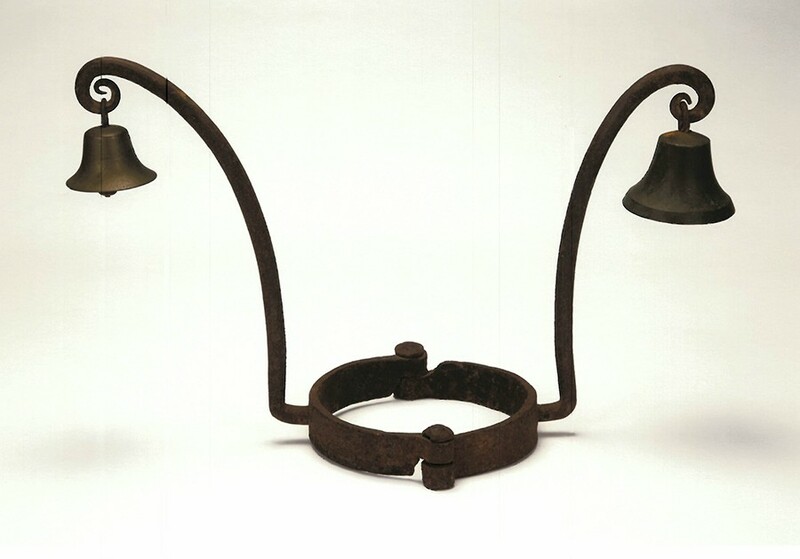 Punishments were severe: whippings; time in the "hotbox," a hole in the ground; wearing an iron collar with bells attached. There is one such collar on display in "Purchased Lives." It weighs six pounds, roughly the same as a brick. Slavery was officially abolished in 1865, but in a lot of ways, it still goes on. Immediately after the war, many freed slaves, without homes or tools or even clothing of their own, continued to work the plantations as sharecroppers; one of those plantations, Angola, which belonged to Isaac Franklin, who ran the largest slave-trading operation in the nation, is now the Louisiana State Penitentiary, a high-security prison farm. At the end of Reconstruction in 1877, many of the antebellum government officials returned to power and established the restrictive Jim Crow laws that effectively made blacks second-class citizens. "Any hope for change fell apart," says Greenwald. And families who had been separated during slavery remained divided. As late as 1912, former slaves placed ads in the Southwestern Christian Advocate, a newspaper circulated in five states throughout the deep south and often read aloud by pastors to their congregations on Sundays. There is a searchable database of 2,400 of these "Lost Friends" ads in "Purchased Lives." For the IHMEC version of the exhibition, Weininger prepared an installation of enlarged copies of 22 ads that have some connection to Illinois. Some of the ads were placed by people who had moved to Illinois during the Great Migration or were searching for people who had last been seen heading to Illinois many years ago.